The best, in fact the only, budget pick with sit-walk capacities. Electra desks far outperform their price tags, offering serious stability to go with their surprisingly large lift capacities. Electra desks do have a tendency to develop grease streaking along their legs after prolonged use. While not visible, the streaks are apparent to the touch. Most modern manufacturers of adjustable-height desks make them for standing users. Considerations related to treadmill desking are generally added as an afterthought, if at all. 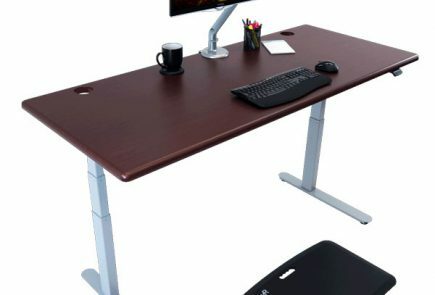 Most desks handle the upgrade well, and will cover the basic needs of your average walking worker, but some are especially suited to the task. iMovR is among the first to produce adjustable height desks designed for treadmill desking. iMovR makes the broadest line of adjustable-height desks and tables. 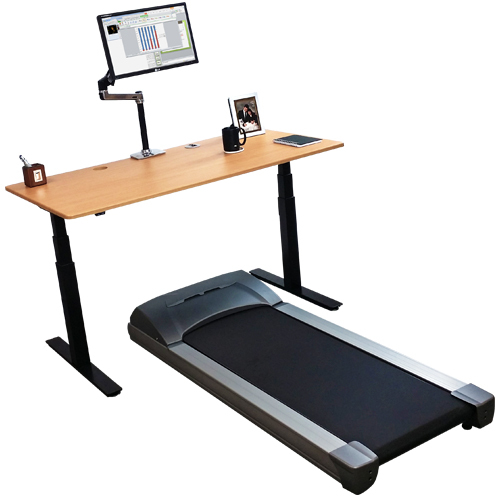 Their Everest, Olympus, Denali, Elite, Electra, and Ellure models were specifically designed to be the cornerstones of state-of-the-art walking workstations, and come with a few treadmill desk-specific features worth mentioning. 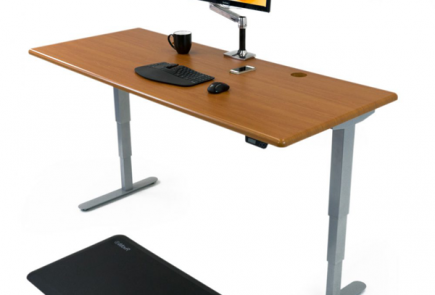 This review focuses on the advantages of the Electra, iMovR’s heaviest-lifting electric desk. One adjustable-height desk capable of accommodating the two previous ingredients side-by-side. You probably have the second item, and the first is widely available. Most people start to run into trouble while trying to find ingredient number 3. 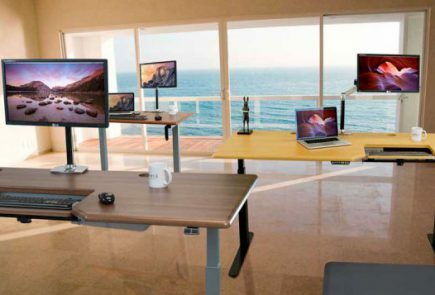 There simply aren’t all that many desks on the market designed to stretch to sit-walk dimensions. The first was the Steelcase Walkstation, but that desk came with its own suite of issues, like a very high sticker price, a subpar treadmill, and a table that could only just barely manage the minimum distance required for a sit-walk desk. The RISE table came along later, and offered a much better option, but is hampered by supply-chain problems. For a while, we thought we were plain out of luck. Then iMovR came along. Both the Elite and the Electra – iMovR’s two electric desks – can stretch to accommodate a sit-walk setup. We’re extremely impressed with the Elite, but we found something in the Electra that we haven’t seen before – a budget sit-walk desk. While the Electra lacks some of the premium features found on more expensive options, like a digital readout controller, it still does excellent work as a sit-walk desk. Electra bases can stretch out to a roomy 74” distance between the desk’s legs, more than enough to fit a treadmill and desk underneath, but come in a much lower price point than other desks capable of hitting that mark. Sit-walk has long been an exclusively premium option, but those days are over. The Electra brings this setup within reach of the average desker. The Electra’s extra-tall vertical range of adjustment paves the way for taller workers to get walking. While most desks manage a maximum height of around 48”, the Electra tacks on a few more, going all the way up to a stately 51”. If you’ve long since gotten sick of friends asking you “how the weather feels up there”, you’ll appreciate those three extra inches. A standard desk can reach ergonomic heights for around 95% of workers, but when you add in a 4” high treadmill, that percentage drops sharply. Electras, with their extended stroke, can help reclaim some of that territory. Users who want to squeeze a little more height from the Electra will want to take a look at the optional caster wheel kit available with it. They add another couple of inches to the desk’s height, and allow you to move the desk around quickly and easily. 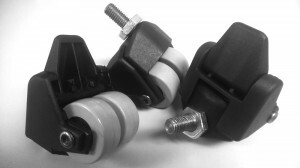 Once positioned, you can lock the casters in place to keep before you start walking on the treadmill. We had a welcome shock while weight-testing the Electra. The desk came with a stated weight limit of 180 lbs. Fair enough, we thought, no reason for a mid-line electric desk to have an Olympic level of push. But as we piled more and more weight onto the table, we found it functioning without complaint. In fact, it made it all the way to 490 lbs before we hit a cut-off. iMovR doesn’t recommend hitting this limit, but it gave us a decent idea of what we were dealing with. The Electra is solid as the proverbial rock, making it uniquely suited to the rigors of treadmill desking. Most deskers tend to “anchor” to their desks by leaning on them while they walk. It’s a natural response, and helps keep walkers upright – never a bad thing – but it does tend to communicate some vibration to the monitor. There are several ways to minimize the problem, but one of the easiest is to invest in a well-built desk. The Electra, with its impressive weight capacity, keeps monitors steady, even with an anchored desker. Shake does enter the equation a little more aggressively if the Electra is fully extended, but that’s a consequence of full extension, common to all adjustable desks. Beginning deskers can opt to grab themselves a true desking starter pack by enhancing their Electra with a couple of choice iMovR upgrades. Keyboard trays always come in high on the list of recommended ergonomic accessories. These handy devices are both height and tilt-adjustable, features that help keep a deskers wrists and forearms in helpful, neutral positions. The Electra, Elite, and Ellure models can come bundled with the iMovR Stowaway Keyboard Tray. Stowaways mount easily on any iMovR desk, and slide from side-to-side to reach optimal ergonomic positions. Not only that, but iMovR tabletops come with predrilled pilot holes, which help cut down on the hassle of keyboard tray installation. Optional grommet-mounted power stations add a couple of outlets at the desktop level. By keeping plugs close at hand, power stations make plugging in laptops, phones, or novelty lamps more convenient while simultaneously cutting down on cable snarl. iMovR desks match up perfectly with our Editors’ Picks in the treadmill category: the TR1200-DT3 and TR5000-DT3 from Lifespan. Either would do a desk proud – pair them up with a 72″ or 83″ wide Electra, throw in an office chair, and you’ve got yourself the bare bones of a truly great sit-walk workstation. For more information about the ThermoDesk Electra Adjustable Height Desk – including sizes, colors, warranty, delivery upgrades, and shipping information – check out WorkWhileWalking’s Store. It’s worth mentioning iMovR’s EcoLast TreadTop Standing Mat as a great add-on for the Electra, or any treadmill desk for that matter. When you want to take a pause from walking the last thing you want to do is stand on the cushion-less hard deck of a treadmill for very long, lest your feet start to suffer. These TreadTop mats are premium-quality, 100% polyurethane standing mats that are cut to size to specifically fit popular office treadmill models. They can be used atop the treadmill deck, or on the floor beside the treadmill if you have a 72-inch Electra. Be sure to check out our 5-star review of the TreadTop Anti-Fatigue Mat to see which size of mat would be compatible with your particular office treadmill.